When news broke about the brutal and senseless killing of Chris Lane, a young Australian studying in Oklahoma, there was universal disgust and sympathy. It was the sort of random crime that leaves everyone struggling to comprehend how it could occur. Everyone except Fox News, who immediately set out to politicize it to advance their racist agenda. 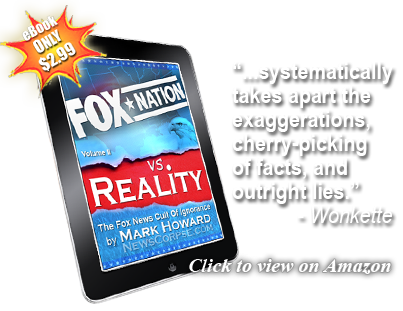 Almost without hesitation, Fox News, as well as other right-wingers like Rush Limbaugh, Allen West, etc., began misinforming their audiences by falsely alleging that the attack on Lane was racially motivated. Not only is there no evidence to suggest that, but one of the three attackers was white. 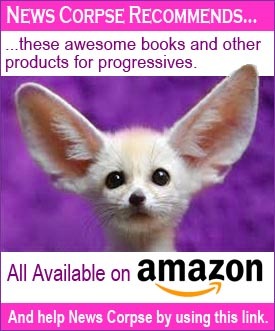 Nevertheless, Fox and the rest of the conservative circus commenced to question what civil rights activists Jesse Jackson and Al Sharpton, as well as President Obama, had to say about the murder. This was an obvious and nauseating attempt to transform the tragic incident into a political issue. They asserted that there was a connection between Lane’s murder and the killing of Trayvon Martin by the overzealous neighborhood watch captain, George Zimmerman. The absurdity of that comparison is evident to anyone who was paying attention to the Martin case. The reason that people were so infuriated was that Zimmerman had been briefly questioned and then released with no further legal accountability. The protests that erupted were aimed at securing justice: an arrest, an investigation, and if warranted, a trial. That’s what was missing in the Martin case, and that’s why people were speaking out about it. In the Lane case, the perpetrators were identified quickly, arrested, and remain incarcerated awaiting trial. So justice is being served. It is proceeding in an appropriate manner without the need for the public to intercede. 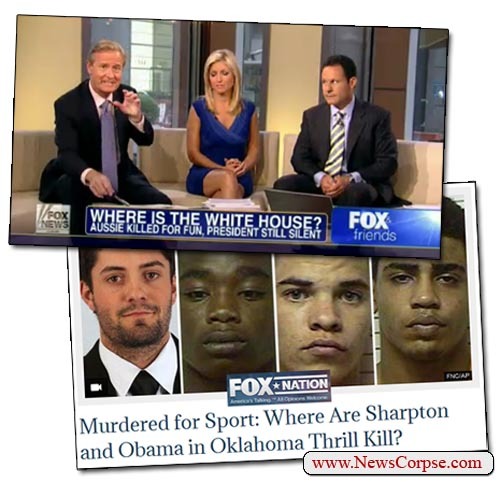 So what exactly do the folks at Fox News want Sharpton and Obama to say? Do they now believe that every crime ought to elicit a comment from the White House? Or is it just the ones that conservatives can spin as racially inflammatory? The Fox News mentality is still trying demonize Trayvon Martin and to excuse the Florida authorities for failing to hold Zimmerman accountable in the early stages of the affair. They have no grasp that what incensed people was that a black teenager didn’t seem to deserve the respect or protection of the law. Chris Lane’s murder has been handled completely differently. The suspects were not sent home with a pat on the back. They are going to be subjected to the full weight of the legal system and to any appropriate punishment if found guilty. Had that happened in Martin’s case it would not have been a national news story. And the only thing making Lane’s case a national story is right-wing media latching onto it in order to disparage their ideological foes. Lane is being used as a pawn in their game of race-baiting. This murder has nothing in common with Martin’s murder, and the rank exploitation of it demonstrates how utterly ignorant conservatives are about the core issues in the Martin case. It also demonstrates that conservatives are bent on inciting racial animus at every opportunity, whether there is justification or not. Well stated, Mark. Sharpton closed today’s program with a briefer version of what you said. Jesse Jackson’s comment was something about how this kind of shooting “should be frowned upon.” Huh? Is that the best they can do? However, Jackson did previously addressed that school bus beating in Mississippi, so he hasn’t been totally silent. I will give him that much credit. Getting Sharpton to talk about these incidents has been like pulling teeth. Why does this stick in right-wingers’ craw so badly? I can’t figure out what was wrong with the President saying this. Read Kathleen Parker’s latest column. She explains it perfectly.